When I first saw the musical – probably close to 20 years ago – I had no idea that it was based on a classic novel, and all I can really remember is that it was dark and gloomy, and seemed to be all about the French Revolution. So it was with some trepidation that I picked up a copy of the book; the font was small and I envisaged a novel full of dreary tales and chapters made up entirely of the phrase, “Vive la Révolution!” However, it transpires that the backdrop for Hugo’s novel is not the French Revolution as most people believe, which means my pre-judgement of it was waaaaaay off base! From the very first page, I was hooked – this was a novel I could not put down. It was one of the best classics I’ve read in a long time; it was powerful and poignant and very poetic, despite the often gruelling nature of its subject matter. Hugo writes in a beautifully evocative way. I often found myself shivering with cold, experiencing numb feet and a gnawing hunger in my belly, along with the main characters. I was drawn in, and my imagination was in overdrive as I pictured the dark cobbled streets of Paris, run-down old buildings, and a vast contrast between the rich and the poor. It is very difficult to summarise the plot without ruining the story. The characters and events are so cleverly intertwined, and each adds another layer to an already fascinating tale, that I feel I would spoil it for you if I tried. The main plot is the story of ex-convict, Jean Valjean, and his journey to becoming a good person; he is unable to escape his dark past, but various characters along the way help him to create a better life for himself and those he comes in contact with. He draws on each experience to benefit others, and pay forward the forgiveness and love that was shown to him at the beginning of the story. 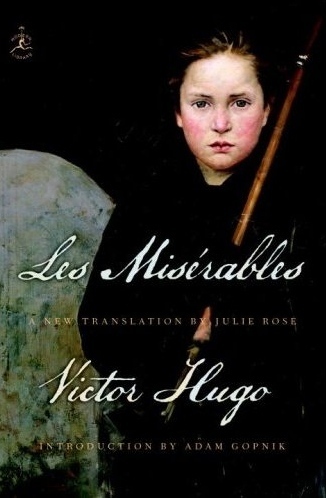 Essentially, Les Misérables is a story about the power of love, social injustice, and right versus wrong (or perhaps legality versus morality). These themes run strongly through each sub-plot, adding to the complexity and intrigue. I can’t recommend Les Misérables enough! Go to your local library or better yet, treat yourself to a copy – this is a book that every book lover should own. It exceeded all expectations, and was a beautifully harrowing tale of struggle, morality and humanity. Well-written, and well-deserving of being considered one of the best novels of the nineteenth-century. Interestingly my preconceived ideas are pretty much the same as your own were. I am now looking forward to the prospect of reading it instead of avoiding it.